If an undergraduate degree in psychology seems an odd foundation for a successful career as entrepreneur and business owner, you only have to meet Steve McLean ‘91 to learn its logic. McLean is co-founder and partner of Wild Blue Technologies, Inc., based in De Pere, Wis. He describes the company as “a strategic experiential design firm” that helps make the retail shopping experience something customers want to do, rather than have to do. The company’s clients are predominantly international Fortune 500 consumer goods businesses, the companies who make the products we consume or use every day. “Psychology helps us understand what differentiates an enjoyable experience from a run-of-the-mill experience,” said McLean. “We have a good understanding of the inputs that affect behavior, so we work hard to design the experience we want our clients’ customers to have. And that experience can be in the physical or digital space, so we have to consider everything that goes into that experience. To make that happen, Wild Blue Technologies focuses its eclectic team of employees on the client’s total customer experience. That might start with the typical elements of a brand: a logo or a color palette, selection of a font, design of a product package or signage, and evaluation of the way a product is displayed on a shelf. And then the team takes it one more step: It creates the entire purchasing experience under the roofs of its sprawling, 50,000-square-foot studios in De Pere. This allows clients to evaluate everything from their customers’ perspective. Often that means building prototypes that can be placed in a retail store, where team members can observe consumer behavior. 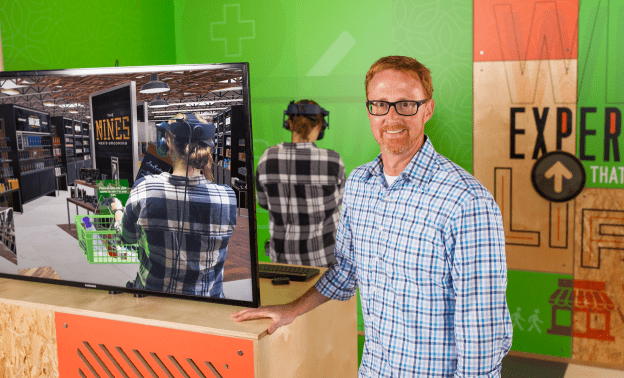 Sometimes it means creating a virtual-reality store, where shoppers can experience a number of prototypes before time and money are spent on the real-world models. Creating that experience involves artists, designers, writers, carpenters, model makers, animators, engineers, code writers and virtual-reality experts. Every one of the company’s 60 employees team contributes to every client’s project in some way, which brings diversity of thought, experience and professional perspective to every challenge. The result gives Wild Blue Technologies’ clients a tangible proof of concept where they can see, hear and feel a potential solution, just as their customers would. That experience brings the strategy to life in a way that even the most effective hard-copy, two-dimensional presentation cannot. As a result, clients feel more comfortable investing in the solution, confident that it will help their customers will feel more engaged while exploring their products. And there you have it: Human psychology at work in the world of the entrepreneur and businessman. McLean, who grew up in Marinette, Wis., did not set out to become a business owner, but he wanted to avoid student loan debt while securing his college education, so he worked full-time at a local printing company while he attended UW-Green Bay. He was headed toward graduate studies in Psychology when his employer made him an offer almost any struggling student would take. “They liked my work and offered me the opportunity to work for them in a project estimating role while I sorted out my graduate school options,” he said. “I wound up staying for several years. As those client relationships grew, McLean’s role evolved from purveyor of the product to strategic partner, offering his clients insights into ways their customers’ shopping trips could be transformed from routine, commodity-based transactions to pleasant, personalized shopping experiences. He also began to help them see where digital technology could be applied to their businesses. His original partner eventually moved on to other interests and McLean connected with Will Van Epern. Today, they share part of the client service responsibilities for major accounts and contribute to other team members’ client challenges and assignments. McLean advises today’s students to retain that sense of curiosity about the world, no matter where they spend their careers. Story by freelance writer Jim Streed ’05. Photos submitted by Steve McLean.